Trying new things, exploring new tastes, seeing new places…these are all some of the best moments life has to offer. It’s how memories are made and time can seemingly stand still all in the same moment. For our second annual “Miss en Place” event, all of these notions serve up the inspiration behind our “Branching Out” theme. 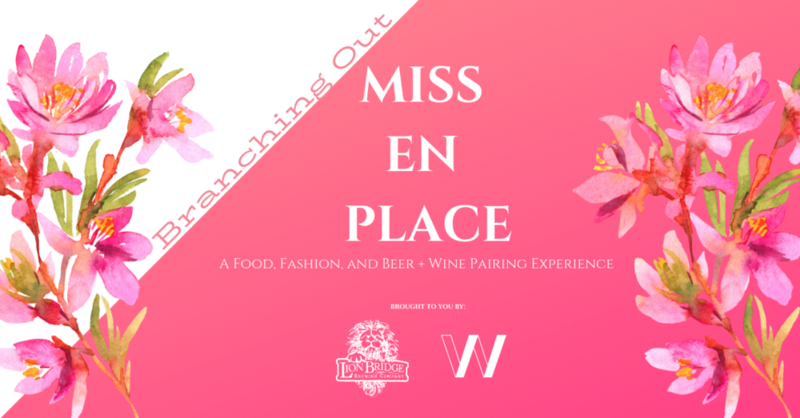 The Miss en Place: Branching Out experience will be another fabulous collaboration between Lion Bridge Brewing Company and WRITTEN Apparel. Both companies have seen tremendous growth over the past year with expansion into new premium products for their respective followers. Now, they look to share those with you in a synergistic pairing of food, fashion, and beer and wine. Four courses created by the talented Lion Bridge Kitchen will be paired with featured looks from the Spring/Summer 2019 Collection of WRITTEN Apparel all for previewing on the Lion Bridge Catwalk. Beer and wine pairing suggestions will be available à la carte so that you can truly create your own one-of-a-kind experience. The “Miss en Place” menu will be released in March 2019. Grab your friends and bring them to Lion Bridge on April 30th to join in on a unique and fun event that celebrates the creativity and entrepreneurship of women in our community. Additional women owned businesses such as Dollup Beauty and The Dostal House will be showcased throughout the evening, with more to be announced, as well. Throughout the evening, co-owner of Lion Bridge Brewing Company, Ana McClain, and founder & creative director of WRITTEN Apparel, Emily Carlson, will be present to mingle and talk about what inspired this year’s collaboration. Following the fashion show, the WRITTEN Apparel Spring/Summer ’19 collection will be available for order exclusively for event attendees. Last year, this was a sold out event, so be sure to get your tickets well in advance! Sorry, No refunds 24 hours before the event.